Red blood cells make up a portion of blood. A normal red blood count is 13.8 to 17.2 grams per deciliter; women have a lower red blood count, between 12.1 and 15.1gm/dL, according to Medline Plus, a publication of the National Institutes of Health. Lower than normal numbers indicate anemia. A red blood count of 7.7 gm/dL is much lower than normal; physicians may consider doing a blood transfusion if levels drop to 7 gm/dL or less, the University of Medicine and Dentistry of New Jersey states. A lower than normal red blood count can be caused by several medical issues. Medical conditions that cause blood loss can cause the red blood count to drop down to levels of 7.7 gm/dL. While small amounts of blood loss, the most common cause of anemia according to the National Heart, Blood and Lung Institute, won't normally cause a large drop in the red blood count, acute or chronic internal bleeding can cause the red blood count to drop severely. Heavy menstrual periods are the most common cause of anemia in women of childbearing age, the University of Maryland Medical Center states. One of the most common causes of decreased red blood cell production and red blood count as low as 7.7 gm/dl is iron deficiency anemia, where low levels of iron decrease the production of red blood cells. Impaired absorption or inadequate intake also decreases iron stores. Low iron levels also occur in pregnancy. Some cancers and chemotherapy and radiation to treat cancer can also decrease red blood cell production and anemia. Some chronic diseases such as chronic inflammatory diseases can also interfere with red blood cell production, the Mayo Clinic says. Plastic anemia, which can be congenital or develop later in life, results in an inability to produce red blood cells. Thalassemia, an inherited disease, also causes decreased production. Vitamin B12 deficiency can cause megaloblastic anemia, in which the red blood cells produced are abnormally large. Sickle cell anemia, an inherited disease, causes sickle shaped red blood cells with a short life span, the University of Maryland Medical Center says. Very low red blood counts can occur when the red blood cells are produced normally but then destroyed. 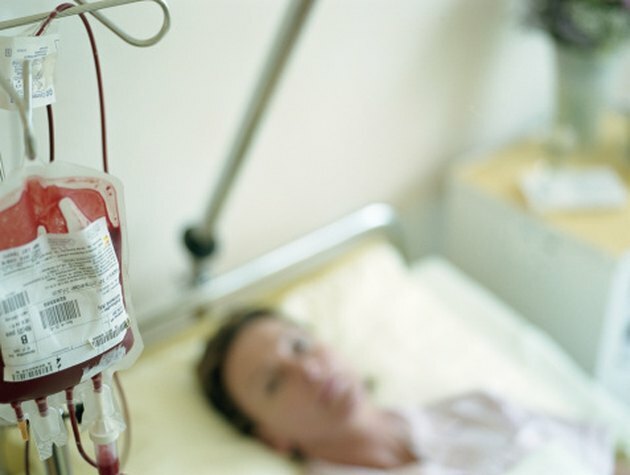 Hemolytic anemias, which can be inherited or acquired, destroy red blood cells faster than they're produced, which may result in a need for blood transfusion, the University of Maryland Medical Center states. Autoimmune diseases and some medications cause hemolytic anemia. National Heart, Lung and Blood Institute: What Causes Anemia?